An ideal package for the devoted commuter, the Blaze/Superflash combines two of Planet Bike's most outrageously bright lights. The Blaze features one LED bulb magnified through a unique fish-eye lens, ensuring great visibility and battery life. The Superflash rear light is a convenient rear light which provides unrivaled visibility. Seriously, don't look straight into this one at close range. Both lights feature strobe and steady beam operating modes. Plant Bike is there for me always Brite,Clear,Efficient! 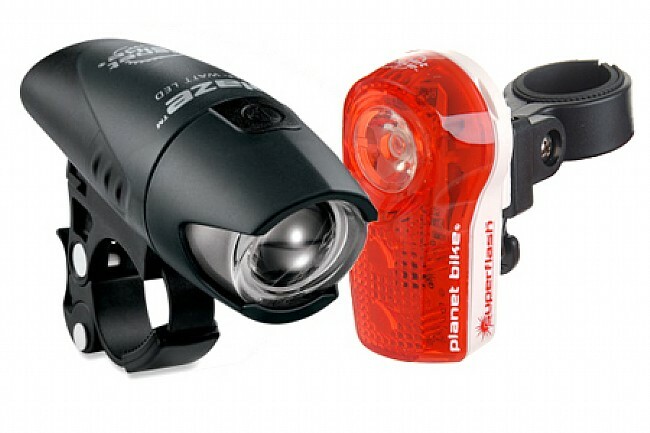 Planet Bike Blaze 2 Watt Front Light and Super Flash rear light are at the top of my list. They represent a very good quality, long living and easy to use lighting system for a real bargain! I do not need lights all that often, as in enough to make me $pend a bunch on a high end rechargeable yet, but when I do I am really comfortable running these! My wife even loves them for her bike! This is the first light set I purchased for my daily commute. It is very effective and bright for 12 watt. I usually use the solid front beam with the flashing rear light and drivers have told me how visible I am during evening/fading light rides on my way home from work. Really easy to install the mounting brackets. Lights clip in/out of mounts easily and quickly. I really like being able to take the lights with me instead of just leaving them on the bike, especially knowing that people will try to take anything that isn't bolted down. I've been abusing planet bike lights for a number of years in Portland, OR. You can be see a bit but mainly these lights are to be seen. Easy to turn on and off while riding. Easy to take the lights off when you ride to work or quick stops into the market. You can also take the front light completely off with ease, for the esthetic day look. The only negative is that I've gone through a number of these lights due to water infiltration. The silver lining is that I've pieced a few lights together using different parts to create Frankenstein lights while other parts sit in bags with rice...it brings them back to life without zombie side effects. In short, the duel package (front & rear) is price friendly for yearly pounding. I like to ride early mornings to 1 hour before sunrise to beat the heat of summer days. I like the light, it gives me the edge needed to handle traffic and dark streets but when I ride over a asphalt seam in the road that gives a small pop (these are the everyday, every ride kind of roads that we all ride safely) to the front fork the light turns off? Im on my second light and both have the same issue. It seems to turn off when entering an intersection when you need it the most. If the light stayed on I would give it a top rating but when the light turns off at any speed I have to give it a failing grade! First of all, this is a great deal on a light set. Installation was fairly simple and straightforward. Batteries are very easy to replace(2 AA's and 2 AAA's). The tail light is one of the best and brightest I've seen. It has a flashing mode and standard lamp mode. The front light is very bright as well. It also has 2 modes. It would be nice if it provided a wider beam, but for the money you just can't beat it. All in all, this is the best value light on the market right now. Head lite is brighter than a $40 Cat Eye, Tail light will put your eye out .... at noon. purchased a $40 Cat eye headlightfor my bike, which is fine but this one is significantly brighter. Read the reviews on the tail light ....none better. Almost blinded in a store with the tail light... probably more important than the head light. Great combo package and the price seems uniform most places. Tail light is $25 everywhere and the headlamp is a steal for $25. Very bright and visible. Best set for the price. This is an excellent set, arguably the best in this price range. I ride in the city as a primary mode of transportation, and try to avoid twilightnight riding when at all possible. That said, these lights serve well during times of necessity. The first night I took them out, the front in flash mode very visible got the attention of a driver who I know was oblivious to my presence until he saw the light. The rear is extremely bright. It puts most of the rear lights I've seen to shame. My only gripe is I needed to do some Jerry rigging to get it on my rear rack with the included hardware, but it's all good once you figure out a solution. FYI, I also had to shim out the front light with a thin strip of rubber. Minor installation annoyances aside, I'd recommend this set wholeheartedly to anyone, most particularly urban and suburban riders who are concerned with safety and visibility.